What is Mars Science Lab Looking for? Below is an image pointing out clays and sulfates in the lower portion of Mount Sharp within Gale Crater. 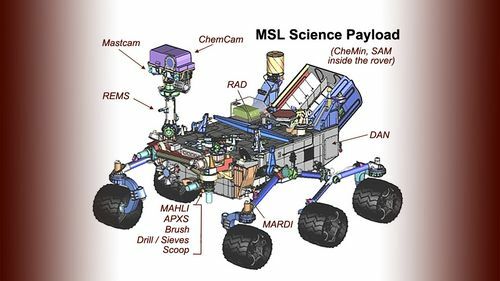 Mars Science Laboratory (MSL) Curiosity is set to land in Gale Crater on Monday 6 Aug at 0100ET. From there MSL will begin examining the surrounding terrain, with special emphasis on the clay minerals and sulfates because those were likely formed during a period when Mars was more hospitable to life as we know it. We know this because clays and sulfates are formed in the presence of water. Orbital studies of Gale Crater have indicated that the water that once filled the crater was less acidic than in other areas previously studied on Mars. Water is more hospitable to life when it is less acidic, so scientists hope that examining the clays and sulfates formed in that water will tell them whether Mars was, or still is a conducive environment to life as we know it. A lot of people think that Mars Science Laboratory was sent to Mars to find life, but this isn't the case. It is landing on Mars to determine if the conditions on Mars were or still are favorable to life. That doesn't mean MSL couldn't find life, it just means that it isn't searching for it. So why does Mars Science Laboratory's mission matter? If we find out that Mars was or still is an environment that can sustain life, it will raise our hopes that it did once contain life. The mission will examine the layers in Mount Sharp, giving us a better understanding of the timeframe during which the water on Mars disappeared. If we know when the water on Mars disappeared we can better determine why and perhaps learn how to prevent such a catastrophe from happening to us on Earth! When we determine how long ago water was abundant on Mars we can start narrowing down our search for life by only examining sediments and other material formed during those time periods since water is generally thought to be necessary for the development of life. So Mars Science Laboratory is key to understanding more about the past on Mars and in the solar system! Learn why MSL's Entry Descent and Landing will be 7 minutes of terror! Today's image of Mars shows banded features indicative of past (and maybe present) glacial flow in Hellas Basin on Mars. The banded features we see in this HIRISE image are similar to those left on Earth where glaciers once flowed. Being able to understand these banded features on Mars will help scientists create a better image of what Mars looked like in the past. Being able to map out the Martian past will let scientists determine at which rate the icy glaciers moved. Understanding the Martian past will help us deal with the present and prepare for future exploration. Just as understanding Earth's past has helped us figure out why different continents have similar features, studying the geologic history of Mars will give us insight into the different features on Mars. Today's Image of Mars comes from Mars Exploration Rover Opportunity during its fifth Martian winter. This image is a panorama of the rover's view from Greeley Haven during its winter stay at the location, between Sol 2811 (21 Dec 2011) and 2947 (8 May 2012) of its mission. The center of this image is looking North, while South is on both sides of the image. Imagine this image wrapped around you with both ends connected, so that you have a 360 degree view. Center left in this image you can see the tracks left by MER Opportunity as it navigated through the area and up to Greeley Haven. The tracks have revealed that the bright soil we see over much of the surface is just a thin layer, under which lies darker soil. Future examinations of surface soil will likely require an examination of the top layer of dust and the underlying darker layer because the two layers are distinctly different. In this image you can see the interior of Endeavour Crater on the right. On the left you can see bright wind blown deposits against an outcrop of Greeley Haven. North, northeast, and east of Greeley Haven you can see even more bright deposits. At the center of the image is a bright patch called North Pole, which MER Opportunity examined in May 2012, as an investigation into bright wind-blown dust. This panorama is a compilation of 817 different images taken by the rover's panoramic camera. I highly recommend you click on the image so you can see the high resolution version and zoom in on all the amazing features! Today we'll take a look at two images of the same area taken a few years apart. Sometime between July 2005 and October 2008, a weak impactor broke up in the atmosphere of Mars and it's constituent parts hit the surface. Scientists know this because a THEMIS image from July 2005 of this area shows no indication that an impact had taken place, while a subsequent image taken by the Context Camera (CTX) aboard Mars Reconnaissance Orbiter in August 2008 showed the surface peppered with small impacts and a dark ejecta blanket. 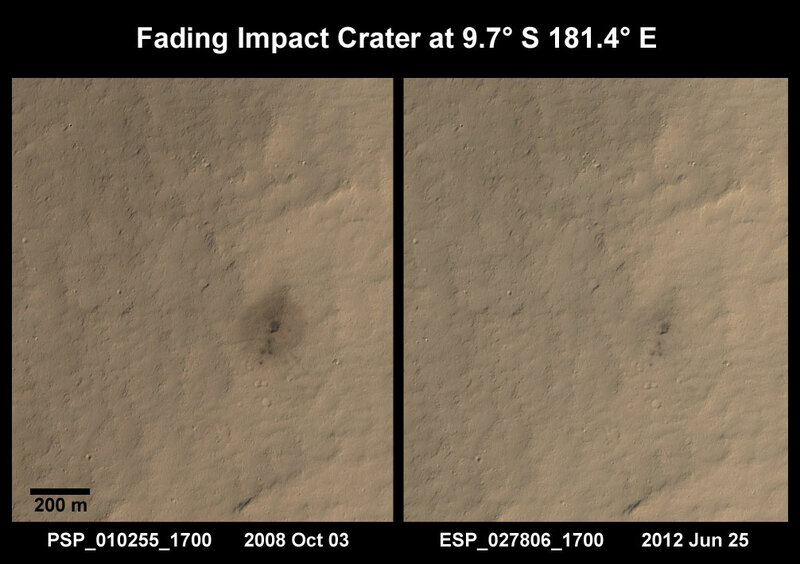 This led the HiRISE team to investigate the impact site in October 2008. 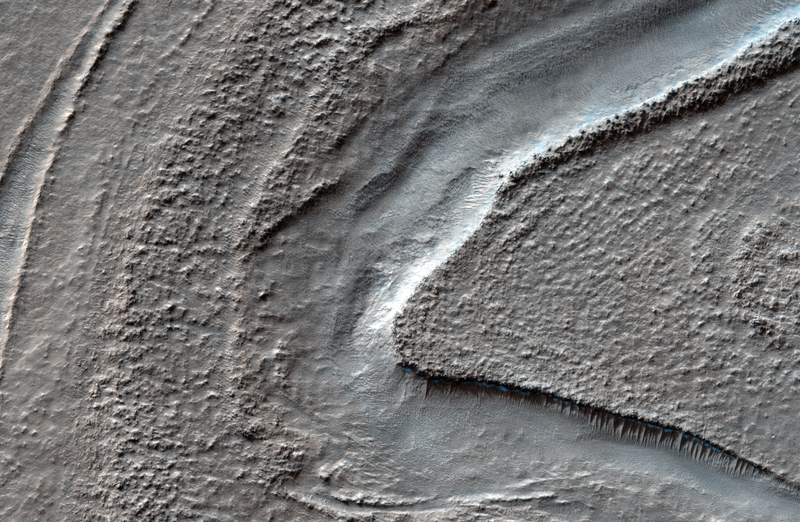 Clicking on this image will take you to the original HiRISE caption referencing this image. In the first HiRISE image we can see the small impact sites and a dark ejecta blanket that seems to stem from the largest of the craters. In the subsequent image taken a few years later we see that the dark ejecta blanket has begun fading. This means that the wind either blew away the dark ejecta, or covered it with the surrounding lighter sediments. Understanding this process and how long it takes is extremely important to future exploration of Mars. When we understand how fast erosion occurs on Mars we can infer how fast the wind is blowing and the amount of sediment that it picks up. Knowing this will help us to take the appropriate precautions that may end up saving lives and equipment. When we know how ferocious erosion will be we will be able to create barriers that can withstand that erosion. Additionally, if we understand the rate at which erosion occurs we can ensure that we choose a more permanent features as navigational references once we do send a manned mission to Mars. This will ensure that people don't get lost or lose sight of their shelter because they expect to see a feature that has recently eroded away. Studying images like the two below will increase scientists understanding of the eroding elements on Mars, and help us to better prepare for the time when we do send a manned mission to Mars. Today's Image of Mars shows a spectacular, yet potentially dangerous feature on Mars at the North Pole. What we see here is a massive ice sheet which, at its center measures a few miles thick. The edges of the ice sheet are sharp cliffs that can sometimes drop over 800m! Scientists are extremely interested in these cliff faces because understanding how they formed helps us understand the record of climate change they hold within them! This image truly highlights why we should continuously, thoroughly examine an area from orbit before sending manned or unmanned missions. By studying this image, and others of the area, scientists have determined that ice pieces are constantly falling from the edge, only to shatter into a million pieces at the bottom! What if we had not studied many different images of the area taken at different times and we tried to send a rover, or worse, a manned mission to Mars to study the cliff faces? People could die, or billions of dollars could be lost because we didn't take and examine more HiRISE images like the one below! So if someday in the future you're taking a stroll on Mars, make sure to check out the HiRISE and other orbital images of the area! You wouldn't want to be walking over a cliff! 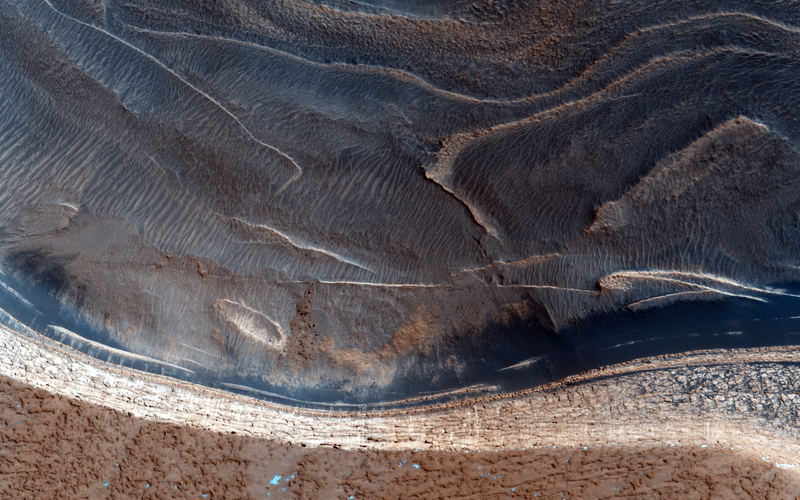 Today's Image of Mars shows how drastically one impact can change the Martian landscape. Scientists believe that one impact near the edge of Noctis Labyrinthus set off an enormous landslide into the canyon. The landslide spans over 25 km, bigger than most of the other landslides within this canyon. What was the source of this landslide? Click to see high resolution image from THEMIS. Credit: NASA/JPL/Arizona State University, R. Luk. There is an approximately 6km wide crater (left center) that scientists speculate caused the massive landslide. This just goes to show that Mars is an ever changing environment and that new discoveries can be made everyday. What one day may look like a boring slab of rock, could the next day be struck by an asteroid, revealing something magnificent and never before seen. Throughout the course of the planets history Mars has been impacted millions of times by asteroids and comets. On occasion these impacts have ruptured underground water reservoirs, causing water to flood the surface. 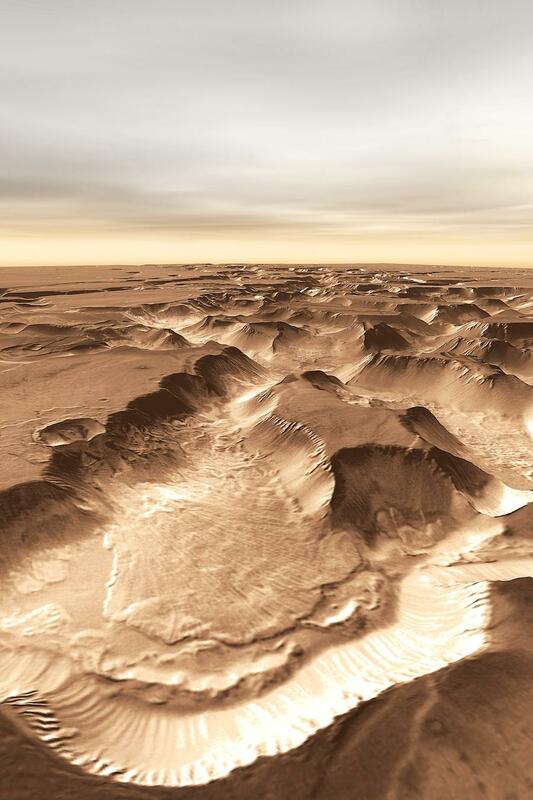 While this has not happened in recent history, scientists speculate that these underground aquifers still exist on Mars today, which means that at any time one of them could crack, spilling massive amounts of water onto the surface. While the possibility of that happening is very small, it is just that, a possibility. Let us hope that one day an asteroid does rupture an underground water reservoir because that might get people interested in Mars again, which would mean that we'd get more funding for future missions! Imagine being able to hike on Mars! How would you plan such a trip? Where would you go? Would you climb mountains, or explore ancient riverbeds? What marvels of Mars would you encounter? One thing's for sure, you'd probably carry a map! But just what would a typical hiking map of an area on Mars look like? Let's look at an area where all sorts of terrain comes together, from mountains to canyons to great expanses of plains! 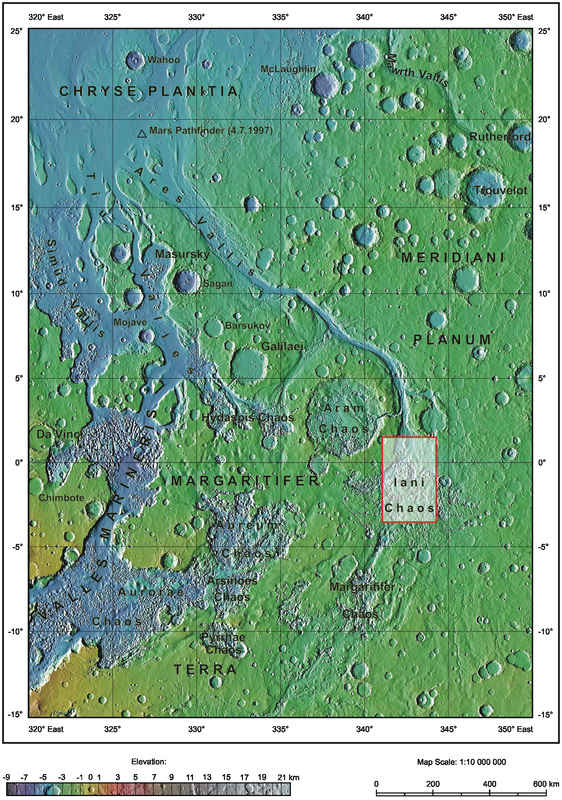 In the map below we see Chryse Planitia, Meridiani Planum, Ares Valles, Iani Chaos, Margaritfer Terra, and Valles Marineris, all distinctly different types of terrain, but interconnected. We also see a future tourist destination: the 1997 landing site of Mars Pathfinder! Sites where the first rovers touched down may one day become extremely popular locations for tourists wishing to see a part of history and marvel at how far we've come! I look forward for the day when I can wait in line to see the great robotic explorers of my childhood! Click on this image to see the original high resolution map from Mars Express.